We’d love your help. Let us know what’s wrong with this preview of The Beggar King by Michelle Barker. To ask other readers questions about The Beggar King, please sign up. Picture if you will, an old woman waving her wooden stew spoon in an alarming fashion as she spits 'I smell mischief and it be a foul soup!' Meet Mama Petrane, one of the Seven Seers of Cir. In a world with two moons, one light and the other darker, there is indeed something wicked afoot, and his name is the Beggar King. Enter Sarmillion, who is an undercat. As far as I can tell, an undercat is basically a human with a furry face, paws, and whiskers. This one is a natty dresser and prowls the str Picture if you will, an old woman waving her wooden stew spoon in an alarming fashion as she spits 'I smell mischief and it be a foul soup!' Meet Mama Petrane, one of the Seven Seers of Cir. In a world with two moons, one light and the other darker, there is indeed something wicked afoot, and his name is the Beggar King. Enter Sarmillion, who is an undercat. As far as I can tell, an undercat is basically a human with a furry face, paws, and whiskers. This one is a natty dresser and prowls the streets and alleys after nightfall in search of female underkitties, but who should not in any way be confused with an ordinary tomcat, of course. Love the parallel. I found this young adult offering to be better written than most of its genre. It was full of images made so clear - an elderly woman with an old-apple face, a jester in the Common who wears 'a hat formed entirely of shoes, each of which proceeded to hop off his head and walk away', a memory slipping away like water through your fingers. Here's my lone complaint - while I understand that young adult novels try to take care with swear, Sarmillion's use of the expression 'Mice alive!' wore very thin, and quickly. I don't think I would feel a bit differently about it if I were indeed a young adult. Almost any other phrase would have been less annoying. The Beggar King, a young adult novel by Michelle Barker, is an enthralling read. I wanted to gulp it down. The world she created is believable, colourful, and interesting. The action moves along at a brisk pace. Love her characters! It is simple enough for a young adult reader, but has enough meat to interest adult readers. I hope to revisit this captivating world in future books! I heartily reccommend The Beggar King! I enjoyed this enchanting story of a young man coming of age who is seduced by a dark supernatural force while pursuing a heroic goal. Michelle Barker creates an intriguing fantasy world, full of colourful characters and imaginative settings. Sarmillion the "undercat" was particularly fascinating. He is a human/cat hybrid who has characteristics of both species--very unique and portrayed vividly. Can't wait for the sequel. 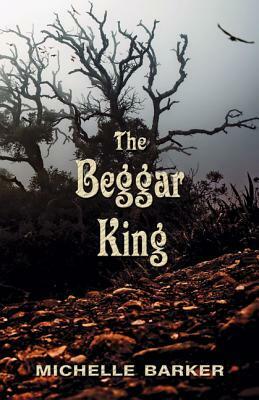 The Beggar King is a compelling read, and though it is a young adult novel there is plenty of timeless wisdom held in beautiful prose, appealing to readers of any age. Amazing book! I was captivated from beginning to end by the incredible world that was created and by Jordan's internal battle between his good and evil sides. This is a book about the in-between, that place that teens occupy as they search for identity as adults while rejecting their childhood identity. The in-between nature of this book stretches out into the position of Jordan as a person who is between the living and the dead when he crosses behind “the wallpaper of the world” to disappear as well as being the person who can open the doorway to the undermagic. He walks in those in-between places, hopping from rooftop to rooftop as he travels, and w This is a book about the in-between, that place that teens occupy as they search for identity as adults while rejecting their childhood identity. The in-between nature of this book stretches out into the position of Jordan as a person who is between the living and the dead when he crosses behind “the wallpaper of the world” to disappear as well as being the person who can open the doorway to the undermagic. He walks in those in-between places, hopping from rooftop to rooftop as he travels, and when he gains the power to become invisible, in the world between the places of our world and the underworld. But, the Holy City of Cir is itself a place betwixt and between – it is an island that can only be reached by bridges, and each bridge can only be crossed at certain times, with certain thoughts and behaviours – each bridge requires the individual to be in a certain mindset before it allows him or her to cross, whether that mindset is mischievous, meditative, or another frame of mind. When it becomes invaded, the Holy City of Cir becomes further liminal, being a place both of the Cirrans and the competing cultural influence of the invading Brinnians. It has become a city in the midst of a clash between traditional religion and the new capitalist imperialism brought by the Brinnians. Jordan is also in a morally liminal place, pulled in different moral directions and stuck with uncertainty about magic and undermagic because of the presence of these moral and cultural Others. The Beggar King reinforces this ambiguity, being both a figure that is in inside and outside of the world, appearing on its fringes, but unable to appear to everyone (only to those suited to open the gateway to the undermagic). Even the term Beggar King is liminal, positioning him between poverty and wealth. Before attaining the power of undermagic, the Beggar King was a sin eater, a scapegoat for his culture who had to eat food that was filled with the sins of the households he begged from. Using these liminal characteristics, Barker suffuses her world with the inherent contradictions that come with youth and the transition to adulthood – the uneasiness and questions that come with transformation and change. Although early in the narrative, prophets see Jordan as a ‘little boy wearing too-big shoes’, his encounters with other aspects of the fringes, other betwixt and between spaces, helps him to grow into those shoes and face an uneasy destiny rather than the one of ease and fame which he would have chosen. He discovers that one never knows the full picture and that when one acts unilaterally, even when he thinks it is the best thing for his community, he brings greater trouble to them. Only by accepting his role as a member of a greater community and recognising the diversity of skills and strengths within the people around him can he gain a complete understanding of the situation that faces him and take actions that are in support of others rather than in service to his own desire to be famous. By observing the emperor who has conquered his territory as well as his own choices, he comes to understand that arrogance is one of the greatest forms of ignorance. Story of 15 year old Jordan Elliott form Cir who lives in a peaceful place full of white magic. His country is invaded by the Brinnians. In the coup his mother, Tanny who is the palace cook, is captured. Jordan fights the oppressors. To escape hanging Jordan accepts the help of the Beggar King that allows him to disappear at will. With this help comes strings and inn his effort to help his people he has placed his friend Ophira and his mother at great risk. In addition Sarmillion, the scribe has Story of 15 year old Jordan Elliott form Cir who lives in a peaceful place full of white magic. His country is invaded by the Brinnians. In the coup his mother, Tanny who is the palace cook, is captured. Jordan fights the oppressors. To escape hanging Jordan accepts the help of the Beggar King that allows him to disappear at will. With this help comes strings and inn his effort to help his people he has placed his friend Ophira and his mother at great risk. Usually fantasy is one of the genres I tend to read the least, but I thought I would give this book a go. Once I got through the second chapter I was unable to put this book down. There is a line midway through the book that stuck with me. It talks about Jordan (the main character) being drawn towards this one bridge and how it takes control over him. I think this best represents how I felt reading The Beggar King. I could not stop reading it for the life of me. The pl A beautifully written fantasy. The plot was creative and fun. And I look forward to more! The Beggar King is a page turning adventure that will leave you wanting more. It's highly imaginative, it's unpredictable, quick moving and I'm recommending it to everyone. Designated for young adults I think it will be enjoyed by all ages. Another Sunburst Award (YA) read, so no rating or review. This book was pretty fun to read. I could hardly put it down when I was reading it. I hope this author writes more books like this. I was born and raised in Vancouver. I attended Arts One at UBC, studied for a year at the Hebrew University of Jerusalem, and graduated with a BA from UBC in English literature. After a short foray into comp lit, I left the Master's program and worked as a research/editing assistant to Sherrill MacLaren. Sailed across the Pacific from Vancouver to Hawaii, had four children, lived for a summer in M I was born and raised in Vancouver. I attended Arts One at UBC, studied for a year at the Hebrew University of Jerusalem, and graduated with a BA from UBC in English literature. After a short foray into comp lit, I left the Master's program and worked as a research/editing assistant to Sherrill MacLaren. Sailed across the Pacific from Vancouver to Hawaii, had four children, lived for a summer in Montreal, a year in France, and then the Eastern Townships of Quebec for 10 years. After spending 7 years in the Okanagan, I've returned to Vancouver. I received my MFA in creative writing at UBC's optional-residency program in 2015. Winner of gold National Magazine award in personal journalism (2002). Finalist for TD Canadian Children's Literature Award (2016), OLA Forest of Reading Golden Oak Award (2017), Chocolate Lily Book Award (2016). Winner of 2017 Surrey International Writers' Conference Storyteller Award. Besides a chapbook of poetry called Old Growth, Clear-Cut: Poems of Haida Gwaii, a YA fantasy novel, The Beggar King (2013), and a picture book called The Year of Borrowed Men (2016), I've also published poetry, short fiction, and a variety of non-fiction. My poetry has appeared in the Best Canadian Poetry anthology (2011). My newest novel, The House of One Thousand Eyes, will be out in Fall, 2018, with Annick Press.